Hindu Calendar: Hindu Calendar now also in Gujarati ! Hindu Calendar now also in Gujarati ! 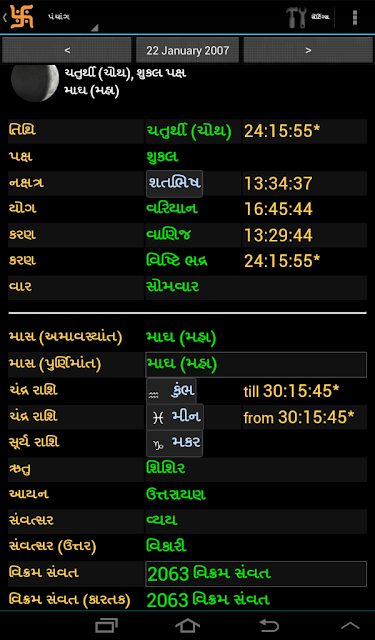 Gujarati language added. Special thanks to Shraman Vakharia! Accuracy of planet position improved. Device Rotation problem for other language fixed, thanks to Vishwas Dubey. Update of Language changes made by contributors. Local languages will not work on all devices. Contribute to the translations at http://goo.gl/D9GAJ . Hi, i"m using this calendar on android, but i have one ipad also, but this calendar is not available in ios. So plz give me some tips for this.